IPMB Verification IP provides an smart way to verify the IPMB two-wire bus. The SmartDV's IPMB Verification IP is fully compliant with version 1.0 and provides the following features. Implemented in native OpenVera, Verilog, SystemC and SystemVerilog. Supported RVM, AVM, VMM, OVM, UVM and non-standard verify env. Supports IPMB specifications version 1.0. 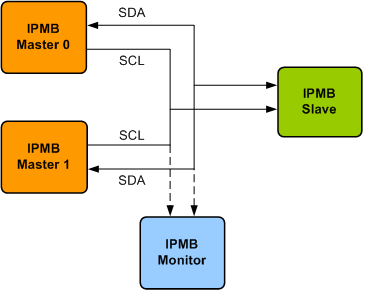 Supports IPMB device types: Master, Slave. Start and stop for all possible transfers. Supports 7bit configurable Slave address. Supports below network function mechanisms. Host ACK followed by device payload. Host NACK followed by STOP. Built-in monitors for protocol checking, including a global bus monitor. Functional coverage to cover all functionality of IPMB Slave and Master. Callbacks in Master and Slave for various events. IPMB Verification IP comes with complete testsuite to test every feature of IPMB specification. Faster testbench development and more complete verification of IPMB designs. SmartDV's IPMB Verification env contains following. Complete regression suite containing all the IPMB testcases to certify IPMB Master/Slave device.